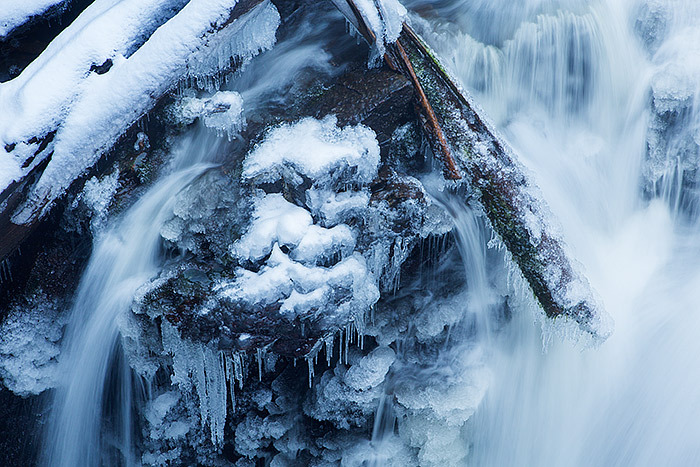 Winter is fast tightening her grip on Adams Falls as ice and snow begin to accumulate on the falls. Located just outside Grand Lake, on the west side of Rocky Mountain National Park, Adams Falls see's thousands of visitors during the warmer months of the year. As the cold settles in to the west side of Rocky Mountain National Park, far fewer visitors spend time observing this beautiful water feature. On this particular day, the air was still and a cold fog hung over Grand Lake and Adams Falls. Other than the noise of the water running over the rocks and ice, the forest was quiet and calm. Photo © copyright by Thomas Mangan.